Kobo has introduced a new e-reader, and the device offers all your typical generational improvements, including faster page turning and a high-resolution display for crisp text. But it also brings a degree of waterproofing to the device, which means it’s better able to handle a trip to the beach, or a surprise rainstorm. All improvements taken together make the Kobo Aura H2O my favorite current e-reader – though sadly, I can’t help but wish my Amazon store purchases were instantly available to it. The Kobo Aura H2O takes one of the best available e-readers on the market, and makes it the best, and that starts with a solid overall design. 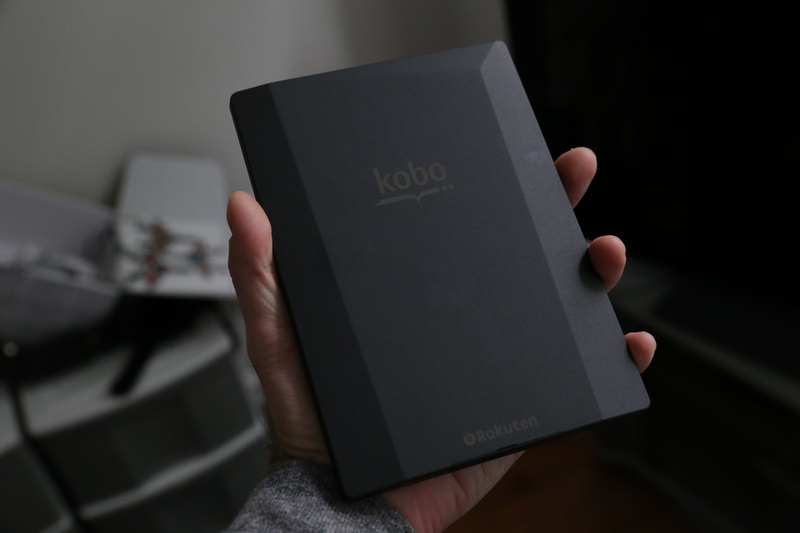 ‘Plastic rectangle’ is basically the common starting point for any and all devices in this category, but Kobo distinguishes their device with some solid ID, including an asymmetrical, 3D pattern on the back that offers subtle but significant aesthetic variation. Kobo’s Aura H2O is larger and slightly heavier than the Kindle Paperwhite, but that doesn’t result in an ergonomic experience that’s noticeably worse, in terms of holding the device during even long reading sessions. Its bezels are just large enough to give your fingers a comfortable resting spot without blocking any of the display, and the added weight is spread across the larger surface of the device in such a way that it actually feels no heavier than the Kindle Paperwhite at all. Kobo’s concession to higher weather resistance is a flap that covers the ports at the bottom of the device, but it’s only a minor inconvenience removing and replacing it for charging and tethered syncing of content. In fact, the cover actually means that the only exterior surface of the device that isn’t completely flush is the sleep/wake button on the top right of the Aura, which actually adds to the overall aesthetic. The Kobo Aura H2O works like you’d hope an e-reader would, which is to say it’s very fast at turning pages and screen refreshes only happy periodically. The goal is to get this stuff to the point where it isn’t noticeable, so that the book is all a user can think about, and Kobo’s tech here looks to be as close as possible to achieving that goal. It’s at least on par with the Paperwhite in these regards. 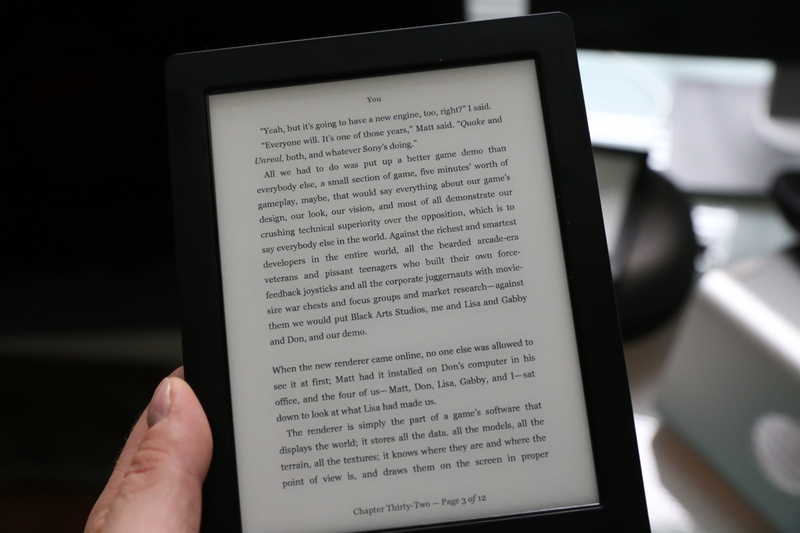 Where it surpasses the Kindle is in screen resolution, which bumps up the rendering of text to the point where everything looks crisp, and that’s only going to make it feel more akin to reading a traditional book. Thus far, we’ve mostly seen LED and LCD screens reap the benefits of ever-higher resolutions – Kobo’s Aura H2O offers e-ink battery savings and readability, but with 265 ppi and full HD resolution, which is something Amazon hasn’t matched yet. The other thing Kobo has done a great job of here is managing to produce an even, highly legible reading light that covers the whole screen and doesn’t appear to offer any variance in intensity. My experience with Paperwhite devices has always been that the lighting is slightly stronger in some areas than others, but Kobo’s tech (the ‘Aura’ in the device’s name) seems consistent and superior. Kobo’s storefront is more integrated and easier to use in fewer clicks than Amazon’s direct from the home screen, but some features and settings can be confusing, like connecting to a Wi-Fi network, which needs better labelling for each step and success/failure. The battery on the device is truly impressive so far, as I still have about half a charge left after a couple of weeks of heavy testing. Kobo’s offering is the peak in terms of e-reader hardware right now – Amazon’s device is slightly smaller and lighter, but you get a far superior screen from the Aura H2O, as well as the built-in water resistance and superior reading light. The only thing you don’t get access to is your Amazon content library – which can be a big turn-off if you’ve already invested heavily in the Kindle ecosystem. Ecosystem lock-in aside, Rakuten-owned Kobo has executed perfectly on e-reader hardware with the Aura H2O – so much so that even if you are invested in Amazon’s bookstore, if you’re a true lover of reading, it could be worth the switch.